A damaged building in Aleppo City, Syria. The United Nations Special Envoy for Syria, Staffan de Mistura, has said that he is “appalled and shocked” by the high number of rockets indiscriminately launched by armed opposition groups on civilian suburbs of Syria's western Aleppo in the past 48 hours. “Those who argue that this is meant to relieve the siege of eastern Aleppo should be reminded that nothing justifies the use of disproportionate and indiscriminate weapons, including heavy ones, on civilian areas and it could amount to war crimes,” Mr. de Mistura said in a statement issued by his office. Attributing credible reports from the ground, the statement noted that scores of civilians in western Aleppo had been killed, including several children, and hundreds wounded due to “relentless and indiscriminate” attacks from armed opposition groups. Further in the statement, the Special Envoy reiterated UN Secretary-General Ban Ki-moon's condemnation of recent attacks on schools, as well as the use of heavy airpower on civilian areas in Aleppo. 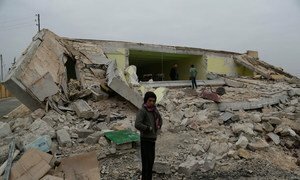 United Nations Secretary-General Ban Ki-moon has condemned the reported attack today on a school in the western part of Syria's Aleppo city that killed a number of children.